Thought all of you might like to see the damage I did on bass over the weekend. The result of the only strike I got in the three hours I fished. Didn’t see any bass in the shallows, nor any beds that would indicate they are starting in on the spawn—although that has to happen soon. Maybe I was just in a non-spawning area. I’m not an expert on warmwater; I just get out there and huck the big uglies like everyone else. I took this fish on a crayfish that I slowly worked along the bottom. And, yes, you’re right—that is a dead fish. I have mixed feelings about having kept it. On one hand it makes a great meal for my daughters and I. On the other, after looking over some management information, that fish may have been a dozen years old. It was legal to keep that fish but I may not do that again. Thought this was interesting: found crayfish pincers in that bass’ belly, which explains why it wanted my fly. Hope you all got out this weekend. If not, maybe you should hit a local bass lake after work this week while all the streams are blown out. 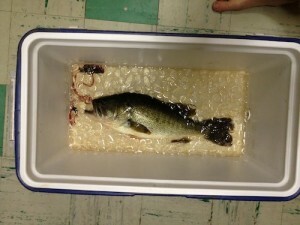 Big bass and pincers I found in the belly. This entry was posted in Culture, Montana, Northern Rockies, Warmwater and tagged crayfish for largemouth bass, Fly Fishing largemouth bass, Largemouth bass. Bookmark the permalink. Will do. Glad you got out. Nice going Greg! I got a couple of those myself on Saturday. Hey, way to go Bob. Did the girls reel any in? I’ll be in touch soon about weekend plans. As far as this week. Tapped out. I think I have the girls for the 38 out of the next 50 days so I have to get some work done. Go get some antlers and catch some bass without me. I’ll live vicariously through you. Beautiful bass. Crazy to think how old it might have been. Did you find any eggs? If it’s a female, it is a little unfortunate that the fishery lost a spawner–unless you caught it on the Bitterroot! But I’m assuming you were lake fishing. Generally speaking, the little guys are tastier and usually males, so it makes a lot more sense to keep them if you keep any at all. Obviously on that day you didn’t have much of a choice. I’ll be heading out to a bass spot or two this week, but if I’m lucky enough to catch any, I’ll have to let them go. 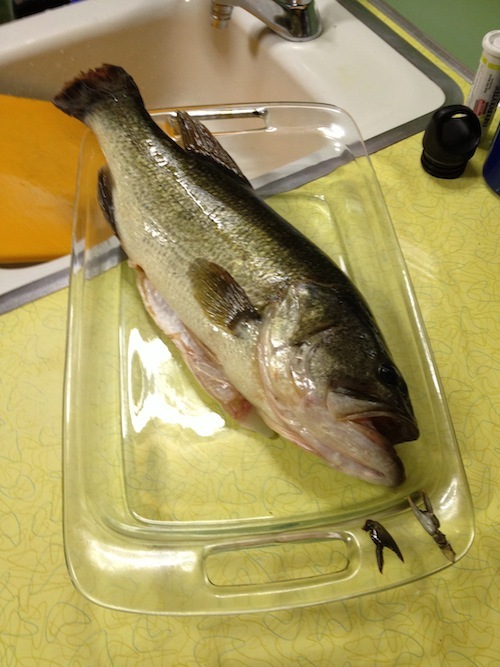 To TJ: bass are sometimes for eating, but it depends on the fishery! No eggs. So it was a male. That made me feel a little better. I’ll have to bone up on bass management so I can make good decisions based on where I’m fishing. If that is a Clark fork or Bitter root fish then it had no right to live, in my opinion. Otherwise, if it tastes good, then eat it. It tasted really good. I caught it in a lake, early enough that it didn’t taste like mud.